Rottweiler Gets Caught Misbehaving and is Very Sorry ! If trained well the Rottweilers behave really good, but sometimes even the best trained dogs misbehave. A video that has gone viral over the internet shows a Rottweiler dog who gets called out for misbehaving. From what we can see in the poor dog's face, he does seem genuinely sorry for his actions. The video uploaded to YouTube originally by youtube user 'bricxr' shows that even the dogs can learn from their mistakes. The owner of the dog said that he filmed the video because he thought the dog looked adorable and people would love it. He also said that the dog seems to have got the point because he has never done the mistake again. 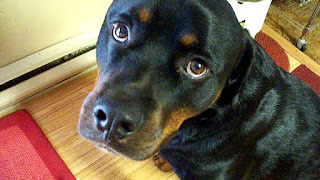 I have owned two Rottweilers,and this is the face they make when they know they did something bad. It has nothing to do with fear,as my dogs don't fear me and most Rottweilers have little fear to speak of.